bit-player reflects on the acceleration of history regarding the paradigms of physics. At amazings.es, Clara Grima explained how to explain her research in computational geometry to 3 year olds (translation). The Renaissance Mathematicus debunks a few myths about Newton’s appointment as Lucasian Professor. Mathalicious doesn’t see online learning as something that will bring down traditional classroom-teaching, but as a tool we should embrace to assist us in the classroom and free up time for the less technical (and more inspiring) parts of math-education. The MIT will start a new online program that is open for everyone, but you have to pay for the examination. Casting out Nines ponders what it could mean for higher education in general, if this is successful. In response to a “Forbes”-list on which problems will disappear for the youngest generation, Teaching College Math lists some new problems that come with the solutions to the old ones. OR by the Beach used Constraint Programming to find a stable marriage of Santa’s Reindeers. The Geomblog continued reporting on the ICDM, writing about social networks and negative results on Stochastic Kroneker graphsand measures for classifier performance. Numbers rule your world reflected on “Derman, Rodrik and the nature of statistical models”. Disquisitiones Mathematicae starts a series on Szemerédi’s regularity Lemma. At The n-Category Cafe, Tom Leinster shares some insights on the law of large numbers from Alex Simpson’s talk at the celebrations of Peter Hancock’s 60th birthday. JD2718 tells the story of Raqnel James, a teacher was falsely accused of aggravated harassment. Frank Morgan gives detailed advice on writing an REU proposal for support from the NSF. Images des Mathématiques has a report from the meeting on Mathematics and Art at the Banff International Research Station (translation). Punk Rock Operations Research gathers OR-flavored pickup lines – and did not forget to include Lem’s Cyberiad love sonnet. Modulo Errors simulates Lichtenberg figures (“captured lightning”) and gives you an applet for your own Christmas tree. Mathematical Magic gives a proof without words of a theorem of Gomory on tailless checkerboards (translation). cp’s mathem-o-blog analyzes the “princess on a graph” puzzle. Angles of Reflection thinks that sometimes low tech is enough for engaging students: Using white-boards for working in groups on problems of the students choice. Math 老师 (lǎoshī) works out a curious identity of angles. I hope this old train breaks down on being the new teacher: suddenly the own opinion is not as valued as it used to be. yofx rocked an algebra final with a Prezi presentation. Models of Reality asks where likelihoods come from – and despite the apparent naivite of the question, Daniel’s post is anything but. The Geomblog comments on the importance of publishing negative results, especially in data mining. mathbabe points out the implication of the conservation law of money for development of economic bubbles and the (European) financial crisis. PhD+epsilon shares the experience of tenure reviews. James Colliander reports on a town hall meeting at the Canadian Mathematical Society’s Winter Meeting. Images des mathématiques explains why the Gaussian distribution appeared at protests in Moscow (translation). Peter Cameron spreads Geoff White’s idea of 50 proofs to read before you die. Ryan O’Donnell is developing a textbook, Analysis of Boolean Functions, publicly on wordpress — read his guest post at Computational Complexity or Gil Kalai’s impressions at Combinatorics and more. 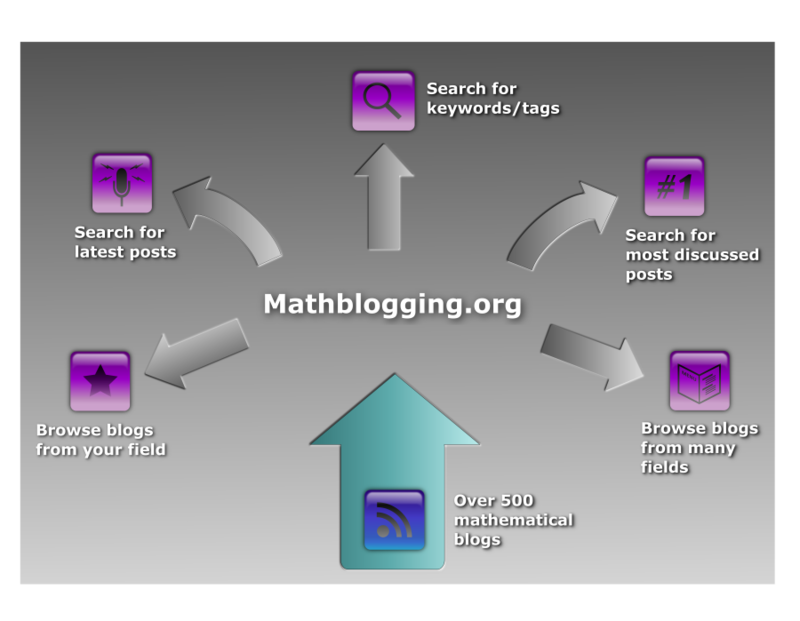 reflectivemathsteacher celebrates its first anniversary — congrats! Popinga hosts the 44th Italian Carnival of Mathematics (translation). MathsInsider chooses its favorite online maths programs of the year. Gaussianos shares a Geogebra-applet for the ruler-and-compass construction of the heptadecagon (translation). Nuit Blanche shares a full year of posts as PDF — a whopping 872 pages! Park Mathematics discussed algebra as a natural thought process, being reflection on past events. Think Thank Thunk inspires with a story of applying mathematics — involves dropping flour bags from a plane! exzuberant discovers how students might get the impression you have favourites even if you don’t, and discusses what to do about it. Nanoexplanations studied a computational geometry problem relevant to printed circuits. #angs@t / angs+, the Antwerp noncommutative geometry seminar’s blog, offered an introduction to surreal numbers as part of a new series on ordinal numbers and algebraic closures. Not Even Wrong reviewed a preprint from the upcoming “String and M-Theory: answering the critics”. Nuit Blanche asked how the effect of changing Lagrange Multipliers in certain models of imaging relates to impressionist art, physical eye defects and the work of Claude Monet. Rhapsody in Numbers described a typical morning of a mathematician doing research while parenting a newborn. mathbabe coined the term horizon bias and discussed its effect on (studies about) diversity in Sillicon Valley and in math departments. You can also support f(t) function of time to get governors to take their state’s achievement tests and publish the results. The Renaissance Mathematicus delved into the history of a Renaissance problem brought up by The Endeavour. Images des Mathématiques has a new series on the invention of the meter (translation). Mathematics for Teaching sought the balance between the polished story and the historical development that led to it. Mr. Palomar took a Borges quote to embark on a journey on mirrors, dreams and fractals (translation). Gli Studenti oggi recorded a conversation about the geometric series (translation). Second Rate Minds had a sci-fi short story about mathematical research. Vi Hart released a new math class doodle video — it’s time for triangles! The Endeavour shared a poem on the sane geniuses. 21st Century Educator collected 10.000 tweets of #pencilchat gone viral. Think Thank Thunk is grieving for grades after teaching without grading for an entire semester. Exzuberant offered ideas for end-of-year maths classes. f(t) function of time took lots of good ideas for learning about surfaces and volume, and turns it into a coherent story for the classroom. Peter Cameron had a masters student point him to some excellent lecture notes by Peter Sarnak on Appolonian circle packing. Terry Tao started a lecture notes series on expander graphs while E. Kowalski mused about his notes on expanders and two different Caley graphs of the group of order 2. If you haven’t followed the debate on TCS breakthrough in matrix multiplication, you can read up on it at Gödel’s Lost Letter and P=NP (and you might also check out a short comment at Yet Another Math Programmer). Punk Rock OR gave advice on how to choose your academic family. MAA’s Launchings by David Bressoud analyzed the CBMS report on faculty development in college&university math departments in the US. SymOmega debated grade scaling policies. Area 777 gets you from diverging triangle approximations of a smooth surface to building an actual lantern. Again, we’re running late, so here’s an efficient looking list. The Number Warrior shared a perspective on the “multiplication is not repeated addition”-saga. dy/dan once more kicks off a lively discussion. Are there students who are incapable of learning Algebra? How to handle Homework? Angles of Reflection describes his system. In the ongoing series about reaction networks, Azimuth had a rather self-contained post about the practical applications of the deficiency zero theorem to diatomic molecules. Finally, check out What’s New (with Terry Tao) and a post on the Bourgain-Sarnak-Ziegler orthogonality criterium; in the comments you’ll find a short but fascinating conversation among researchers. A CS Professor analyzed a Khan Academy video on insertion sort. The n-Lab started its own peer-review process. Piece of Mind shared a week in his life as a (traveling) mathematician. Series Divergentes (translation) took apart a crank claim for the discovery of a 3-dim norm algebra. Geometry and the imagination gave insight into the geometrical meaning of the Hall-Witt identity. The Renaissance Mathematicus demolished the Cult of St Alan (Turing). Rudi Matematici (translation) celebrated the mathematicians of the Italian Risorgimento. You are currently viewing the archives for December, 2011 at Mathblogging.org -- the Blog.